(CNN) -- Blistering temperatures and winds battered parts of the upper Midwest on Tuesday, delivering to some states the coldest weather in decades. 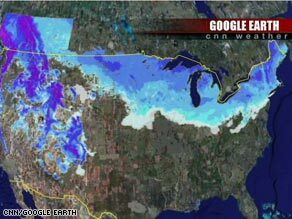 A chilling cold front is battering the upper Midwest and Great Lakes. On the heels of a blizzard that barreled into the Northern Plains, temperatures dropped to minus 18 degrees Fahrenheit in Minneapolis, Minnesota. In Hayward, Wisconsin, a man who was prone to sleepwalking died after exposure to the freezing temperatures there, according to CNN affiliate KDLH-TV in Duluth, Minnesota. Authorities said the man's son reported him missing about noon Tuesday. Police told KDLH they found bare footprints leading 190 feet away from the man's home. For Tony Williams, the temperature in Minneapolis, Minnesota, was more than his body could handle. After shoveling outside his home without gloves for 45 minutes in minus-17-degree weather, Williams suffered second-degree frostbite, according to CNN affiliate KARE-TV. "On his finger pads, all of his fingers and his thumb, he had the formation of blisters," Dr. Cheryl Adkinson, an emergency physician at Hennepin County Medical Center who treated Williams, told KARE. In Grand Forks, North Dakota, the weather was severe enough to break a record temperature from 1979, with minus 37 degrees, according to the National Weather Service. The blast of cold, snow and ice wreaked havoc on traffic throughout the Midwest. In cities across the area, schools and businesses shut their doors because of the icy temperatures, and residents tried to dig out their cars and streets. iReport.com: How is winter weather affecting you? Wearing several layers under his bright orange coat, he tried working without a face mask. That didn't last long. "Two or three minutes [without it], and my face was burning," he told WGN. In the next couple of days, forecasters aren't predicting much of a letup. The weather system, known as an "Alberta clipper," is expected to bring gusty winds, plummeting temperatures and a couple of inches of snow to Chicago, Illinois, on Wednesday morning, according to the weather service. The system will bring many states in the Midwest the coldest days of the season, with hazardous wind chills. The weather service forecasters predicted snowfall of 1 to 5 inches from the Dakotas to the southern Great Lakes and even to the Northeast by the end of the week. "Near-whiteout conditions and slick roads are expected to impact travel of all types," according to the weather service's central region headquarters. After previous blasts of snow and cold, airports in Chicago, Minneapolis, Milwaukee, Wisconsin; and Grand Rapids and Detroit, Michigan, are expected to have continuing delays, Arduino said. Temperatures in Detroit are expected to reach minus 18 degrees Wednesday and minus 12 degrees Thursday. In Minneapolis, the front will bring temperatures down to minus 21 degrees Wednesday and minus 29 degrees Thursday. In Bismarck, North Dakota, temperatures on Wednesday will dip near minus 20, with wind chills as low as minus 45 degrees. In the next couple of days, forecasters said, the city could receive 3 to 6 inches of snow on top of the 5 inches dumped there by the last winter system.